Kookaburra have as ever released a spectacular range of cricket bats for the 2018 cricket season, including the ever present but newly designed Kahuna. After a very popular 2017 the Blaze if back but with newly designed graphics. Surge and Ghost are also both still in the range but have also been given a fresh look by Kookaburra for this season. New for 2018 is the Kookaburra Fever with is strking design this is guranteed to be a big hit this season, Fever has been deleloped by Kookaburra to have a massive impaact both in appearance and profile. All Kookaburra 2018 bats conform the MCC Law 5. 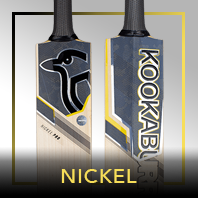 Brand new for 2018 the Kookaburra Fever range is something completely different in design to other Kookaburra bats and has been designed for impact both in profile and appearance. 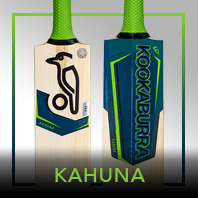 Kookaburra Fever 800 - A new design from Kookaburra the Fever 800 offers a strking contrast to other bats with the Kookaburra range, made from grade 3 English willow this bat is guranteed to be a popular addition to the Kookaburra family. Kookaburra Fever Max - Striking Black and Yellow graphics give this bat the impact in terms of design and the heavyweight profile gives it the impact on the field, ideal for the power player who looks to hit the ball out the ground. Handmade from Grade 4 English Willow and available from 2lb12-3lb. 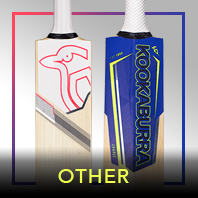 Kookaburra Fever 300 -Different in appearance and performance. This Grade Five willow contains a mid-blade sweet spot and the visually large edges, profile and appealing presence of the blade will leave you standing out from the crowd. Handmade from Grade 5 english willow and avaialble in weight range 2lb7-2lb9. The Iconic Kahuna cricket bat is back for a 16th year and it is not hard to see why this has been one of the most popular bats for all this time. 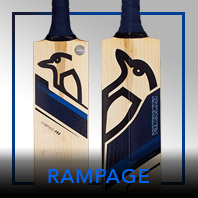 The classic Kookaburra bat shape with it's powerful profile, big edges and world renowned graphics make it ideal for the stroke maker who likes to take control and lead by example. Kahuna Pro - Handmade using 'Players' Quality specially selected Grade 1 Unbleached English Willow, weight range 2lb8-2lb11oz. Kahuna 2500 - Handmade using 'Premium' Grade 1 Unbleached English Willow, weight range 2lb8-2lb11oz. Kahuna 1000 - Handmade using 'Premium' Grade 2 Unbleached English Willow, weight range 2lb8-2lb11oz. Kahuna 600 - Handmade using handmade using Premium Grade 3 unbleached English willow. 2lbs 8 oz - 2lbs 11oz. Kahuna Lite - Handmade using Premium Grade 4 unbleached English willow. 2lb7-2lb8oz. The Blaze range has been re-developed after being very popular and is sure to be the same this year, with simple but striking graphics the Blaze range looks the part and profile allows you to push the boundaries and as you would expect from a bat designed by Jos Butler meets all the needs of the modern day player. Blaze Pro - The Kookaburra Blaze Pro Cricket Bat has been handmade using specially selected Premium Grade 1 unbleached English willow and includes a Free of charge padded bat cover. Weight range 2.8-2lb-2lb11oz. Blaze 2000 - The Kookaburra Blaze 1500 Cricket Bat has been handmade using Premium Grade 1 unbleached English willow and includes a Free of charge padded bat cover. Weight range 2.8-2lb-2lb11oz. Blaze 900 - The Kookaburra Blaze 900 Cricket Bat has been handmade using Premium Grade 2 unbleached English willow. Weight range 2.8-2lb-2lb11oz. Blaze 500 - The Kookaburra Blaze 500 Cricket Bat has been handmade using Premium Grade 3 unbleached English willow. Weight range 2.8-2lb-2lb11oz. Blaze 250 - The Kookaburra Blaze 250 Cricket Bat has been handmade using Premium Grade 4 unbleached English willow. Weight range 2.8-2lb-2lb11oz. Blaze 100 - The Kookaburra Blaze 100 Cricket Bat has been handmade using unbleached English willow. Weight range 2.8-2lb-2lb11oz. 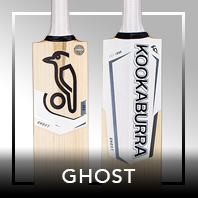 Kookaburra Surge and Ghost have both been rediesigned for 2018 and are available in a number of willow grading's making them the perfect choice for all abilities and budgets. Kookaburra is one of the largest manufacturers of cricket gear and their bats are endorsed by some of the best cricket players in the world. Originally AG Thompson Ltd, this Australian manufacturer has been producing quality cricket equipment since 1890. Founded by an Englishman, Alfred Grace Thompson, a saddle and harness maker with a love for sport, he was already highly regarded for being one of Australia’s leading hand-made cricket ball manufacturers. Kookaburra cricket bats are now renowned worldwide for their superior quality bats and endorsement by elite batsmen in all cricket playing nations. You can up your game by using Kookaburra cricket bats, safe in the knowledge that they won’t let you down. Hit harder with hand crafted, English willow Kookaburra cricket bats that are traditionally seasoned to produce stronger hitting areas. Whether you want a smooth pickup or a well-balanced bat; Kookaburra bats are known worldwide for their superior strength and performance. To see the inside story on Kookaburra bat making process and how to pick the best Kookaburra bat for your click on the following link.